This young couple who work on one of the Royal Caribbean cruise -ships were a delight to work with. Since they visit Cayman frequently when their ship is in port they had a good idea of what they wanted for their custom Cayman Wedding. 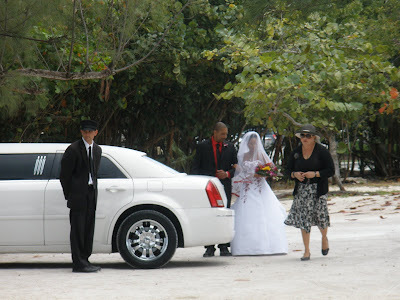 The bride and some of the wedding party were picked up from the cruise landing by limousine. While limousine service does not come standard with our packages, this can be arranged. The groom is from the UK and the bride from Zimbabwe. They were fortunate to have both sets of parents ( from the UK and New Zealand) as well as the groom's aunt, present, and able to take part in the wedding. Here we are next to the water at Governor's beach. A large group of friends and co-workers from the cruise ship formed an aisle for the bride and her father to walk down, with much clapping and and shouts of "Good Luck". 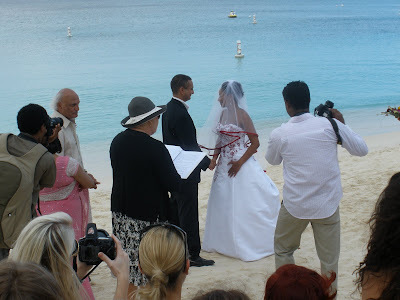 We do quite a few weddings every year for couples who work, and often meet each other on one of the cruise ships which bring hundreds of thousands of visitors to our islands every year. As the groom is Hindu, and the bride Christian, I wrote a special ceremony for them. In this ceremony their wedding vows are based on the Seven Blessings in a Hindu marriage ceremony. To honour the bride's Christian heritage, one of the readings chosen was from 1 Corinthians, the new English version ..."Love is patient, Love is kind etc." After the ceremony, all the guests enjoyed champagne on the beach and then it was off to a local restaurant, Casanova's for the wedding reception and lunch. Since I expect to get official photos at a later date, I will post more details at that point. Ceremony by Joy, arrangements by Peggy Moorhead for Simply Weddings, custom floral arrangements supplied by Trisha's Roses, toasting champagne "Simply Weddings Bubbly" our own label from Cayman Corker. These unofficial photos taken with my Olympus 370FE. When you want to make it official, call the cruise wedding experts at Simply Weddings - Grand Cayman Wedding Celebrants and Planners. Call Joy or Peggy at +1 (345) 9499933. Cruise wedding packages, and cruise wedding vow renewal packages available. Call today, we book only one cruise ceremony per day, so you can have our full-attention. 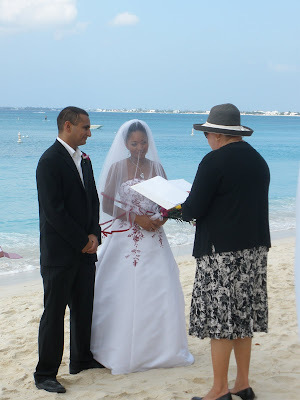 When you have to have the very best, call Simply Weddings for a Cayman wedding to remember. Visit us on Facebook and find Joy of Weddings on Twitter.